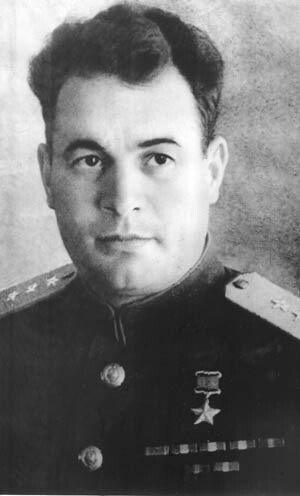 The Red Army's General Ivan D. Chernyakhovsky achieved a combat record that is virtually unknown in the West. The American jeep holding the 3rd Belorussian Front Commander, General Ivan Danilovich Chernyakhovsky, drove quickly through the city of Mehlsack, just outside Königsberg. He was on his way to visit the headquarters of Lt. Gen. A.V. Gorbatov, commander of his 3rd Army, and did not want to be late. Chernyakhovsky had six other Army headquarters under his command and planned on visiting every one before the final offensive. Approaching a fork in the road about a half-mile outside the city, a single artillery shell landed close by, churning the earth with fire, raising a huge cloud of dust and debris, and bringing the Willys to an abrupt and jarring halt. Gorbatov was approaching from the east and arrived just as the shell exploded. Even before the smoke had dissipated, Gorbatov reached the jeep, dismounted, and looked inside. He saw that driver B.I. Vinogradov, the front commander’s adjutant, and two escorting soldiers were dazed but unhurt, and the vehicle appeared undamaged. He soon realized, however, just how costly the single blast had been. There, slumped in the front seat next to the driver, was the bloodstained body of the front commander. The gravely wounded man, gasping for breath, spoke to Gorbatov, repeating several times, “I’m fatally wounded, I’m dying.“ General Ivan D. Chernyakhovsky, liberator of Kursk, Vilna, Kovno, and several other places, twice Hero of the Soviet Union, first general to set foot on German territory, the youngest front commander, and highest ranking Jewish officer in the Soviet Red Army, had fallen with the final victory clearly in sight. He was among the last of 235 Soviet generals to die in battle in the Great Patriotic War. I.D. Chernyakhovsky, the youngest of four children and son of a railroad clerk, was born on June 16, 1906, in the small Ukrainian village of Uman near Kiev. Orphaned during the post-revolution civil strife when his parents perished from typhus, he spent his early years working as a herdsman and on the railway before joining the Red Army at the age of 18. He enrolled as a cadet in the Odessa Infantry School, but after recognizing his natural ability in mathematics and science, the commissars assigned the boy to the artillery. After graduating with distinction from the Kiev Artillery School in 1928, Chernyakhovsky joined the Communist Party. Marked for early advancement, Chernya-khovsky rotated through a series of line and political assignments in the artillery until he was selected to attend the Stalin Military Academy for Mechanization and Motorization in 1931. He spent the next five years studying in the command-engineering section, graduating in 1936. Like officers of similar temperament all over the globe, he had earlier become convinced that armored warfare would dictate the outcome of future struggles and requested assignment as chief of staff of a tank battalion. This was soon followed by promotion to command of a tank regiment (1936-1940), and to deputy commander of a tank division (1940-1941). Tall, handsome, with curly black hair, he was married and the father of a baby girl; the very image of the model Soviet officer. During this tumultuous period, he also demonstrated the talents of loyal party operative and tenacious survivor. Through political skill, guile, and luck, he avoided sharing the fate of one-third of the 80,000 officers in the Soviet Army who were executed, imprisoned, exiled, or cashiered during Stalin’s murderous purge of the military in the late 1930s. His survival was even more extraordinary considering Stalin’s paranoid suspicion of Jews as his natural enemies. His view of Stalin was “orthodox,” but hinted at having questions, which he later shared with the famous journalist and propagandist, Ilya Ehrenburg, whom he met during the war. At the time of the German invasion of the Soviet Union on June 22, 1941, Colonel Chernyakhovsky, regarded as one of the Red Army’s most aggressive and skilled armor officers, was in command of the 28th Tank Division, assigned to the Baltic Special Military and deployed just south of Leningrad. At 9:15 on the evening of the first day of the invasion, the Stavka, or Soviet High Command, oblivious to the reality of the battlefield, ordered every commander to hurl the German invaders back from the borders of the sacred motherland. Chernyakhovsky was already moving toward the front when he received his orders. By that time one of the units under his command, the 55th Tank Regiment, was heavily engaged with the German 1st Panzer Division. With no time to conduct reconnaissance or make adequate preparations and within 24 hours of receiving the order to attack, he had moved forward, taking position at the head of the lead column. After years of hardship and preparation, he now faced the vaunted Wehrmacht—outnumbered, outgunned, on the defensive, and with the initiative totally in the hands of the enemy. Chernyakhovsky attacked and successfully pushed the enemy back several miles while annihilating a full company of Germans mounted on motorcycles. By nightfall on June 25, however, the tide had turned against Chernyakhovsky and his division had been completely shattered; every one of his 85 tanks was destroyed. Thousands of his men lay dead or wounded, or worse, were prisoners of the pitiless Germans. 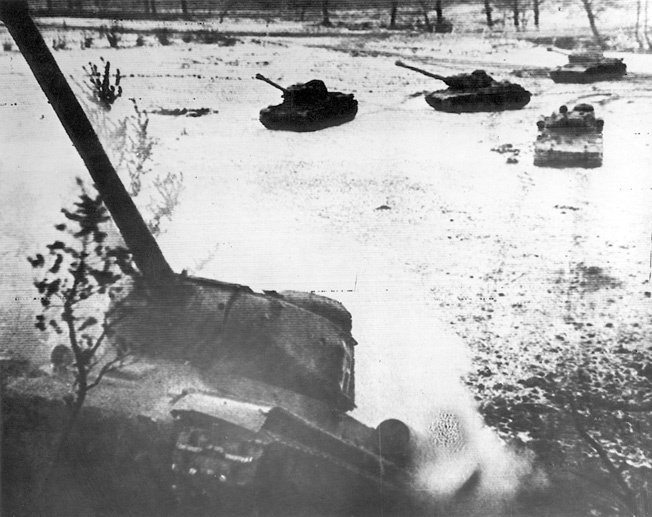 The 28th Tank Division had been erased from the Soviet order of battle, and its remnants were streaming to the rear in disorder and panic. The long, bloody retreat had begun. In the terrible months that followed, Chernyakhovsky continued to distinguish himself in the bloody fighting south of Leningrad, leading his men—hastily reorganized as the 241st Rifle Division—in a desperate series of delaying actions and hopeless rear-guard stands. The reputation of the aggressive, young officer quickly grew, and he was beginning to attract attention at the highest levels. Among his sponsors was the rapidly rising and influential Deputy Supreme Commander, Marshal Georgi Zhukov, as well the Chief of the General Staff, Marshal A.M. Vasilevsky. Within one year of the outbreak of war, through their sponsorship, Chernyakhovsky had been promoted to major general (equivalent to U.S. brigadier general), and in July 1942 he took command of the 60th Army. On January 25, 1943, Chernyakhovsky’s men liberated the city of Voronezh, and on February 8, now under command of the legendary General Konstantin Rokossovsky, he recaptured Kursk. It was there that the propagandist and now war correspondent Ilya Ehrenburg first met and befriended him. Late one night in Kursk, after Chernyakhovsky had regaled Ehrenberg with verses and lighthearted chatter, the conversation turned to the future of warfare and Chernyakhovsky’s mind roamed free. Just one week later, on February 23, 1943, Stalin issued Order No. 95 applauding the recent victories and paying homage to the young commander who was soon promoted to lieutenant general (equivalent to a U.S. major general). While his army remained in reserve during the Battle of Kursk, Rokossovsky continued to regard Chernyakhovsky as his “most capable fighting commander” and continued to expand his army. By the time he entered combat again, his 60th Army numbered almost 100,000 men and was organized into six rifle divisions, two rifle brigades, and a tank brigade and fielded 1,376 artillery pieces and more than a hundred T-34/85 tanks. 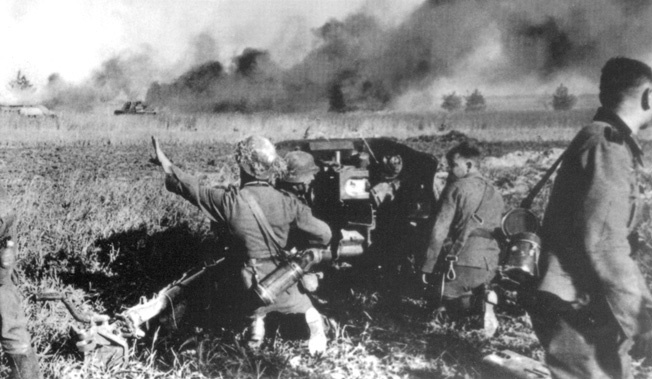 During the desperate fighting in the summer of 1941, a German antitank gun engages Soviet armor on a desolate Russian plain. Smoke from the ongoing battle shrouds the horizon while German tanks roll. During the drive to the borders of East Prussia, on October 17, 1943, Chernyakhovsky was made a Hero of the Soviet Union when he led a spearhead across the Dnieper River, becoming the first to break through the German lines. On March 5, 1944, in further recognition of the crossing of the Dnieper and his subsequent performance in the Ukraine, Marshal Zhukov sent a special telegram to Stalin recommending that Chernyakhovsky be immediately promoted to colonel general (equivalent to U.S. lieutenant general). Stalin made the appointment without argument. Shortly afterward, the Soviet High Command started to make plans for the summer offensive, including a proposed reorganization of the Western Front into two units. On the recommendation of Marshal Vasilevsky and General A.I. Antonov, the deputy chief of the general staff, Stalin approved the appointment of Chernyakhovsky for one of the new commands. On April 12, 1944, Chernyuakhovsky arrived at Western Front headquarters at Krasnoe where on April 24, the three-year-old, battle-scarred unit was dissolved, and the 3rd Belorussian Front was created. Two months later, at age 36, Chernya-khovsky was promoted to Army general (equivalent to a full general in the U.S. Army), becoming the youngest full Army general and front commander in the Red Army. The 3rd Belorussian Front was the equivalent of an American Army Group, and at its peak consisted of six field armies, one air army, and several independent armored and infantry corps, numbering as many as 40 divisions and totaling more than 375,000 men. During the week of May 22, 1944, Stalin ordered his senior commanders to a war council in Moscow to discuss Operation Bagration, which would become the largest campaign of the war. Chernyakhovsky, who after three years of continuous service had fallen seriously ill, realized such a summons could not be ignored and arrived late on May 25 to discuss his suggestions for the upcoming operation. Lt. Gen. V.F. Mernov, a general staff officer and classmate from the artillery school, briefed him. Named for the Russian hero of 1812, the aim of Bagration was to clear Belorussia (now, Belarus) and destroy the 800,000-man battle-hardened Army Group Center under Field Marshal Ernst Busch and later Field Marshal Walther Model. The scale of the Soviet operation was monumental. Their forces numbered 1,400,000 men in 48 armies (166 rifle divisions, 30,000 guns, 5,000 tanks, supported by 6,600 aircraft). Facing them would be 15 Axis armies (42 divisions), backed by 9,500 artillery pieces, 900 tanks, and 1,400 combat aircraft deployed over a 620-mile front with defensive lines as deep as 150 miles. Chernyakhovsky’s 3rd Belorussian Front would command five field armies, including the elite 5th Guards Tank Army, and would be deployed in the Northern Sector to the right of the 1st Baltic Front. His assignment was to lead the right pincer north of Minsk and link up with Rokossovsky’s 1st Belorussian Front, moving south of the city. In the huge pocket they would trap the Fourth and Third Panzer Armies. Scheduled to commence on the third anniversary of the German invasion, the attack began a day late on June 23, 1944. The initial breakthrough was stunningly successful. Chernya-khovsky sliced through the heart of Army Group Center and in rapid succession took Orsha and Borisov, completing the encirclement of Minsk on July 3. His armies then swept through Lithuania, recapturing Vilna on July 13, 1944. Once again, Izvestia published a personal commendation of Chernyakhovsky signed by Stalin. After the liberation of Vilna, Isaac Kowalski, who published the Jewish ghetto’s underground newspaper during the German occupation, secured printing presses and other equipment from the Russians. After doing so, soldiers escorted him to a well-concealed forested area in the hamlet of Woronowa, about 60 kilometers from the city, where the headquarters of the 3rd Belorussian Front was located. At first he was nervous, but it turned out that General Chernyakhovsky wanted to thank him personally. The general graciously lauded Kowalski for his courageous resistance during the occupation. The rapid advance continued. On July 15, the 3rd Belorussian Front crossed the Neiman River and just two weeks later was a scant 15 miles from the East Prussian border. At the end of July, Chernyakhovsky was named a Hero of the Soviet Union a second time for his part in the destruction of Army Group Center. The titanic struggle continued. By the time the 3rd Belorussian Front took Kovno (Kaunas) on August 2, the Germans had lost more than 400,000 men and 25 divisions had been destroyed. On August 17, an advance platoon of the 3rd Belorussian Front crossed the German border, but by the end of the day it had been destroyed, an indication that fighting would intensify as the Germans started defending their own territory. In October, after a brief period of rest and refitting, Chernyakhovsky’s men penetrated almost 50 miles into East Prussia, but their losses were very heavy. The drive did not resume until January 13, 1945. At first, it was very slow going as the Germans resisted bitterly in defense of their homeland. Within a week, however, the overwhelming power of the Soviet drive began to tell. On January 20, Chernya-khovsky’s men captured Tilsit, and the next day Rokossovsky took Tannenberg, site of the great World War I Russian defeat. By the middle of February, Chernyakhovsky isolated Königsberg, the last major prize in East Prussia. Heavy tanks of the Red Army advance across a snow-covered valley and up a hill in East Prussia on February 17, 1945. Within weeks, Soviet armor was in the streets of Berlin. Certain that the end of the war was approaching, he contacted Ilya Ehrenburg, inviting him to “come along quickly if you want to be in at the finish.” Chernyakhovsky made plans to confer with his army commanders to plan the final drive that would pinch off East Prussia and most likely mark the end of the 3rd Belorussian Front’s role, and his own, in the war. He telephoned General Gorbotov to arrange a meeting for February 18. Chernya-khovsky first congratulated his subordinate for his victories and gave him a brief update. They agreed to meet at Gorbotov’s 3rd Army headquarters. So Widespread was Chernyakhovsky’s Reputation that Tributes Flowed in From the Soviet Union’s Allies After His Death. Prime Minister Winston Churchill Sent a Cable to Stalin Expressing His Personal Condolences. Writing in his postwar memoir, Gorbotov remembered looking quickly at his situation maps and warned his commander, “that the road leading there was under enemy observation and artillery fire, but Chernyakhovsky ceased to listen and laid down the receiver.” It was neither the first time nor the last that the approach of victory made soldiers careless. Chernyakhovsky never warned Vinogradov, his longtime driver, that the road to Mehlsack was dangerous, nor did he arrange to have the route reconnoitered by his scouts. When news spread that Chernyakhovsky had been killed in action, there was a great outpouring of emotion and expression of sorrow from soldiers and civilians. So widespread was his reputation that tributes flowed in from the Soviet Union’s allies. Prime Minister Winston Churchill sent a cable to Stalin expressing his personal condolences. After his death, the Red Army transported Chernyakhovsky’s body 200 miles to Vilna and gave him a full military funeral. He was buried in the ancient cemetery at Orzeszkowa Place. A few years later, the great sculptor Nikolay Tomsky executed a monumental sculpture in Chernyakhovsky’s honor. The hero was buried among the thousands of his soldiers and Jewish partisans who had fallen in the liberation of Vilna, known for centuries as the “Jerusalem of Lithuania” because of its world famous centers of learning. Given the fact that there were many cemeteries closer to the site of his death, it remains a mystery why Vilna was chosen, but it is at least plausible that the selection reflected the general’s final wish. In the years following his death, a number of memorials were dedicated to the fallen hero. The town of Insterburg near the site of his death was renamed Chernyakhovsk in his honor. In 1990, Gymnasium #11 in Minsk was designated the I.D. Chernyakhovsky School and a museum was established there. In February 1992, when Lithuania declared its independence, all monuments and other reminders of the Soviet period were dismantled or relocated. That same month, General I.D. Chernyakhovsky, liberator of Vilna, was disinterred and reburied in Moscow. While Chernyakhovsky is now almost totally unknown in the West, the judgment of military historians has been generous. John Erickson, the great English chronicler of the Red Army, described him as a man of “exceptional ability” and “as professional and as nimble as any German commander facing him.” David M. Glantz and Jonathan M. House, the foremost American scholars of the Eastern Front, called his record “brilliant” and noted that he won the respect of the top commanders of the Soviet Army. It is intriguing to wonder how the great hero would have fared after the war had he lived. Would he have received great honors and then been shunted aside as was the fate of his sponsor, Georgi Zhukov? Would he have ended his days, as Ehrenberg mused, an old retired pensioner? Or, would he have finally been sacrificed to Stalin’s anti-Semitic paranoia from which he had only barely escaped earlier? Steven L. Ossad is a retired Wall Street technology analyst now working as an independent military historian. He is the co-author of Major General Maurice Rose: World War II’s Greatest Forgotten Commander, a biography published in June 2003. Tags Alexander Gorbatov, Allies, Axis, Battle of Kursk, Belorussia, Eastern Front, Isaac Kowalski, Ivan Chernyakhovsky, Operation Bagration.